I invited a few friends over for a quiet dinner at my new place and wanted to try out a few new dishes. This is a flavor-packed tenderloin is sure to impress. I love the combination of fresh ginger with peanut butter and soy sauce mixed with lime and orange juices. Searing it on the stovetop makes the outside crispy; finishing it in the oven leaves the inside extra juicy. In a medium bowl, mix together the chutney, garlic, ginger, soy sauce, rice wine vinegar, peanut butter, honey, lime juice and zest, orange juice, red pepper flakes, and black pepper. You want to break up the peanut butter and make sure the marinade is well blended. Trim the pork tenderloin if it needs it. Then place the pork in a large zip-top plastic bag. Pour in the marinade, squeeze out the extra air and seal the bag. Be sure there is marinade on all sides of the pork. Refrigerate the pork for at least two hours to let the marinade soak in. It will be best if you can prep this far ahead of time and allow to marinate overnight. In a large cast iron skillet, heat the olive oil over medium-high heat. Add the tenderloin (save the marinade for a sauce!). Sear on all sides, until it is nice and brown. It should take about 4-6 minutes on each side. Place the entire skillet into the oven and cook until it reaches 160 degrees, which should take about 15-20 minutes. Remove from the oven and allow to rest for at least 10 minutes before serving. Cutting early will result in all the delicious juices running…resulting in a very dry dinner! Meanwhile, pour the leftover marinade into a small saucepan. Bring it to a boil while stirring. You can add a bit more orange juice if you want to thin the sauce. Allow to boil for a minute. This is a really important step, since the marinade had the raw pork in it! You need to kill off any bacteria that may be present. 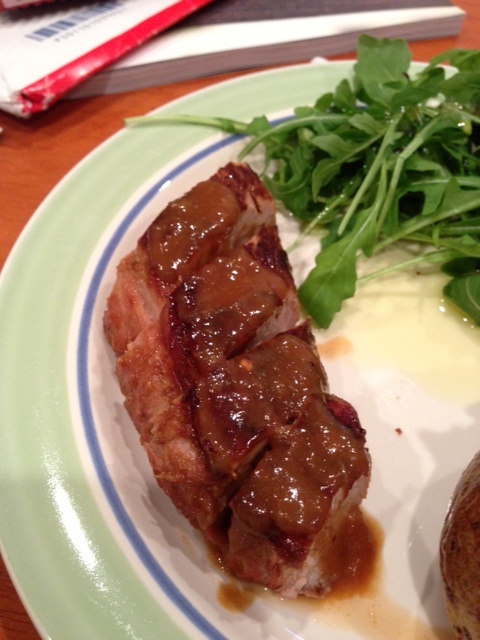 Slice the pork tenderloin and serve topped with the sauce. A good friend of mine recently turned 30. In her honor, I tried my hand at a Cassata Cake. Never heard of it?? Well neither had I! That is until this friend served one at her bridal shower last year. This is a magical dessert that is reminiscent of both cannoli and tiramisu. Be sure to use fresh ricotta; it will be well worth it! You will also need a 9-inch springform for the preparation. In a medium bowl, combine the fresh ricotta with 2 cups of the powdered sugar, a teaspoon of cinnamon, and the vanilla extra until mostly smooth. Stir in the chocolate chips and lemon zest. Cover and refrigerate at least 2 hours. 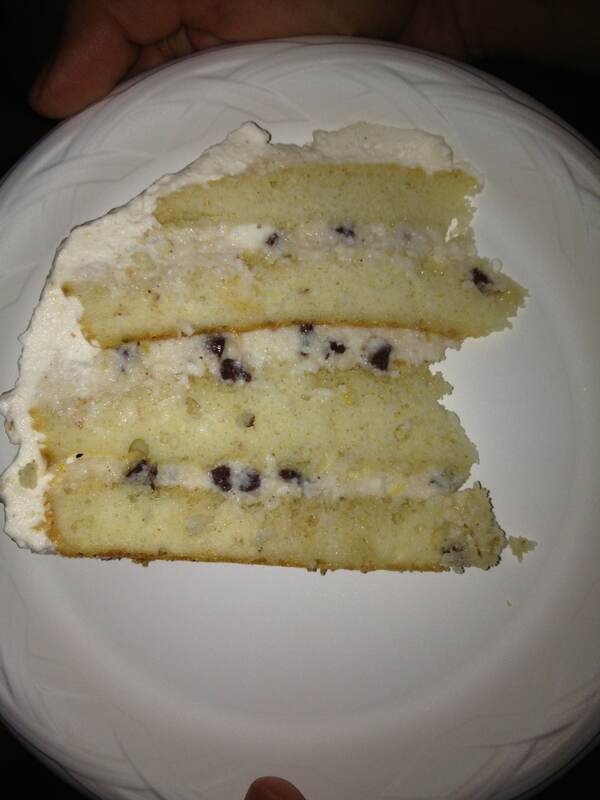 Slice each of the cooled cake layers in half horizontally, into 4 total layers. Combine a half cup of Marsala with the water. Brush the tops of the four cake layers with the liquor mixture. Place a single cake layer in the bottom of a 9-inch springform. Spread with 1/3 of the ricotta mixture. Cover the cake with plastic wrap and refrigerate in the springform for at least 4 hours. You will get the best flavors if you let it chill overnight. When ready to serve, remove the mold from the springform. Transfer the cake to a serving dish. 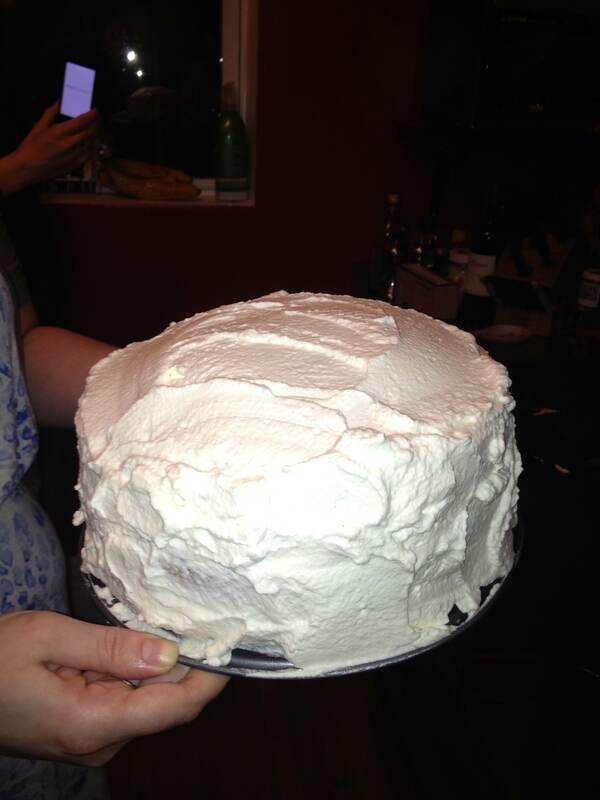 Whip the heavy cream with the remaining 1/4 c of powdered sugar and 2 teaspoons of Marsala until firm peaks form. Serve in the company of great friends! I finally moved into my apartment in Brooklyn! To thank everyone who helped me unpack and hang things on the wall, I ordered pizza delivery from a local spot. My brother brought some Brooklyn Brewery beers to celebrate. I decided to use one of the extra bottles of Brooklyn Lager to make this quick bread. I also used some local honey to make this full of NY flavors. Preheat oven to 350 degrees. Lightly spray a 9×5 inch bread pan or a 9-inch cake pan with cooking spray. Combine the flour with the sugar, baking powder and salt in a medium mixing bowl. Stir in the honey and beer. Be careful! The beer will react with the baking powder to fizz, so be sure the bowl is not too full to start. Pour half of the butter into your prepared dish. Spread the dough in the pan. Top with the remaining butter. Bake until the bread is golden brown on top and a toothpick in the middle comes out clean. A loaf pan should take about 45-60 minutes; the round pan will take about. Best served warm out of the oven with a little fresh honey and butter. The other night I was in the mood for a creamy, bubbly casserole and decided to make one using wild rice instead of pasta or potatoes. 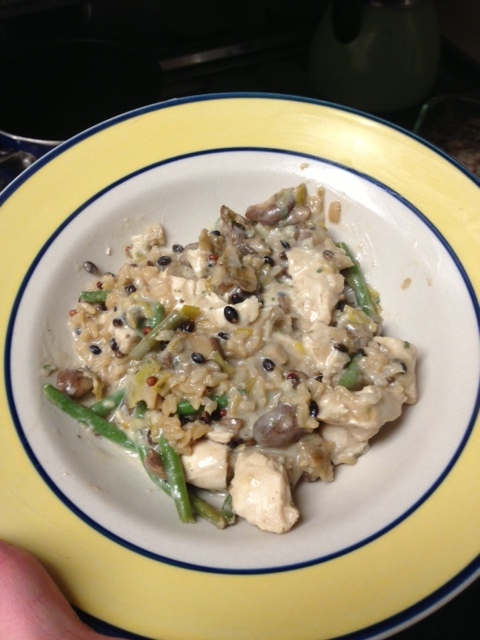 If you want to make this a vegetarian dish, omit the chicken and add more mushrooms. Place chicken in a large skillet. Lightly sprinkle with salt. Cover with water and bring to a boil. Cover and reduce heat. Simmer gently until the chicken is cooked through (10-15 minutes). Drain the chicken and cut into bite-sized pieces. Lightly spray a 9×13-inch baking dish with non-stick cooking spray. Preheat your oven to 350 degrees. In another large skillet, heat the olive oil over medium heat. Add the leeks and cook until just beginning to brown, about 5 minutes. Add the mushrooms and cook until they release their liquid and it has evaporated, about 12 minutes. Stir in the Marsala wine and increase heat to high. Stir occassionally while the wine evaporates almost all the way (5 minutes). Mix the flour into the leek-mushroom mixture to coat. Stir in the milk slowly to avoid clumps. Bring milk to just below a simmer, stirring to avoid scalding. Mix in the cheese, sour cream, parsley, salt, pepper, garlic powder and dried mustard powder. Remove from heat. Spread the prepared rice along the bottom of the baking dish. Top with the chopped chicken. Top with the green beans. Spread the leek-mushroom sauce evenly over the top. Bake 30 minutes. Lightly sprinkle the top with a bit more Parmesan and return to oven until the cheese melts. Allow to rest 10 minutes before serving. Enjoy! 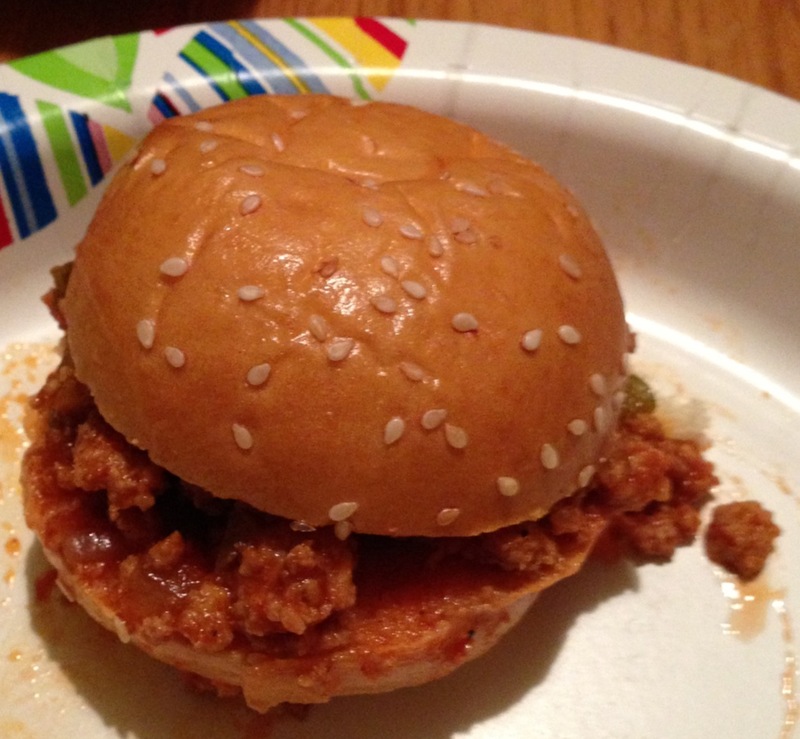 Growing up we used to have sloppy joes fairly regularly for dinner. Usually that meant ground beef plus a can of Manwich or, every once in awhile, some with homemade sauce. I made this lighter version with ground turkey recently for a group of friends. It is easy to make ahead and then keep warm in a crockpot, plus it makes great leftovers. Brown the turkey in the olive oil over medium heat in a large, deep skillet. Drain off excess fat. Stir in the onion, pepper and garlic. Cook 3 minutes. Stir in the chili sauce and ketchup. Mix well. Add the water and tomato paste and stir until well combined. Mix in the brown sugar, dry mustard, chili powder and Worcestershire sauce. Allow to simmer for about 15 minutes. Season with salt and pepper to taste. If the mixture is too liquidy, continue to simmer until desired consistency. 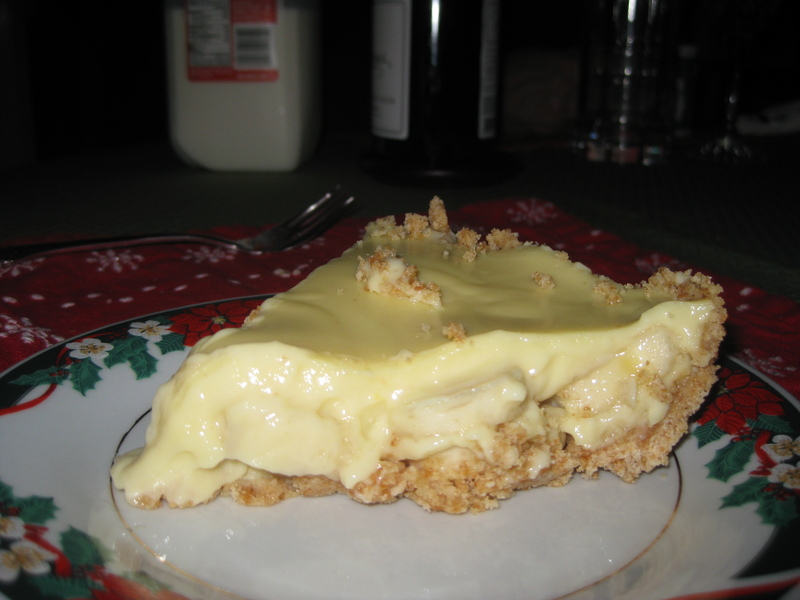 One of my brother’s most favorite desserts is banana cream pie. 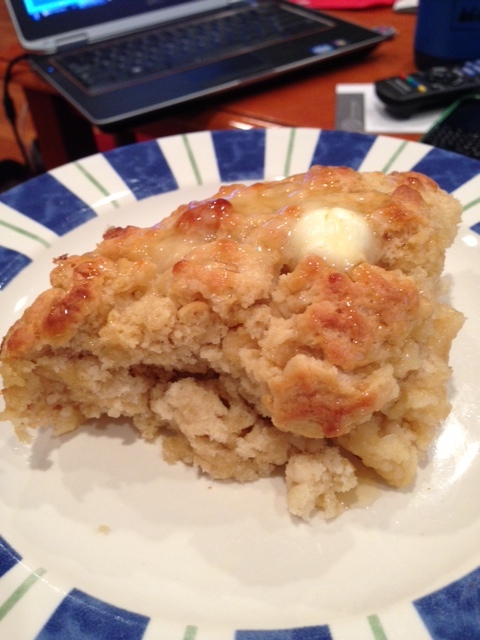 Usually we use a store-bought graham crust and some banana pudding, but I made him this treat from scratch over the holidays. The pudding part is a very light vanilla cream and very easy to make. You will probably never want instant pudding again! Also, vanilla pudding means you want to use nice, ripe bananas to get the most from their flavor. In a small bowl, combine the vanilla wafer crumbs with one tablespoon of cinnamon and 1/3 cup of melted butter. 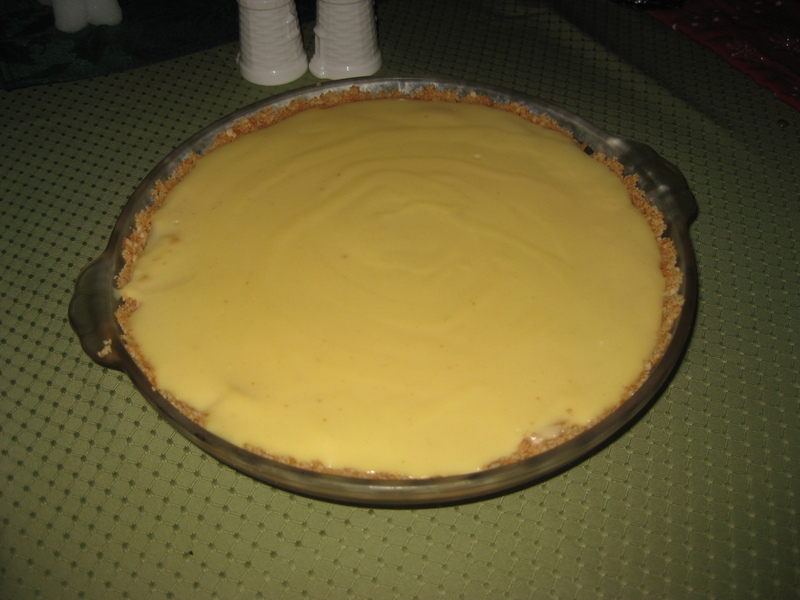 Press the mixture into a 9-inch glass pie plate to create a crust along the bottom and up the sides. Try to make it an even thickness. Bake for 10-15 minutes until just turning golden brown. Remove from the oven and allow to cool completely before using. Scald the milk in a large saucepan by bringing it to just about boiling. The milk should begin to come to a light froth with tiny bubbles forming around the pan edges. You will want to keep stirring the milk occasionally while you wait — this will prevent scorching along the bottom and edges! In another large saucepan, mix together the sugar, flour and salt. Gradually whisk in the scalded milk. Cook until thickened over medium heat while whisking constantly. Cover and cook for another two minutes, whisking occasionally. Add a small amount of the hot milk mixture to the bowl of eggs while stirring. Add another small amount and combine thoroughly. This tempers the egg yolks and prevents scrambling in the next step! Whisk the egg yolks into the larger pot of the hot milk mixture. Cook for one more minute while whisking. Remove the pudding from the heat and whisk in the butter, vanilla and a dash of cinnamon. Let cool until lukewarm, whisking occasionally. Slice your bananas and place them in your pie shell. Pour the lukewarm pudding over the bananas. Allow to cool before serving. Store in the fridge! You are currently browsing the Muffin Bites blog archives for February, 2013.